WILLEMSTAD – The Parliament of Curacao debated on the sanctions ordinance of Curacao. This debate actually focused on the issues of human rights violation in Venezuela. Gerrit Schotte MP asked if the European Union imposes sanctions on Venezuela, should Curacao also follow the same steps. Schotte wants to know if the same agreement, which was signed during the Kingdom Conference in the Netherlands, is valid. This agreement states that each country in the Dutch Kingdom will have their own policy on foreign relations. Schotte hopes that there will be no changes made to this agreement. This could mean that the countries, especially the Dutch Caribbean islands, will lose their autonomy. 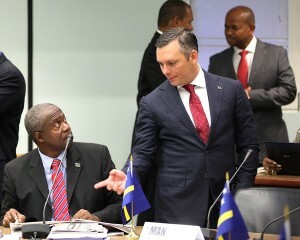 “If the Netherlands imposes sanctions on Venezuela for violating human rights, what will happen then with the negotiations between Curacao and the South American country for the future of the oil refinery?” Schotte asked. Independent MP, Omayra Leeflang indicated that sanctions ordinance is not new. It’s an existing law. According to the MP, Curacao has to choose for its security and you do not get it by isolating yourself. You get security by being part of a group, like in our case, the Dutch Kingdom. “It’s not the European Union that is forcing us to adopt this ordinance, it’s the fact that we belong to the Dutch Kingdom. We have chosen in a referendum that we want to continue being part of this Kingdom, which means that you have to give and take,” the Independent MP said. “We cannot assume a position where we take a stand and our partners in the Kingdom have other opinion on the issue,” Leeflang declared. The MP agrees that if the European Union imposes sanctions on Venezuela, Curacao will have to follow the same path. The MP for MAN, Hensley Koeiman, argued that Curacao does not have to apply the double standard like the Netherlands. Koeiman believes that the wellbeing of the island is the number one priority. “We can impose sanctions on e.g. Venezuela, but the whole community must stand behind it,” Koeiman said. “I can imagine that there are reasons for Curacao to also impose sanctions just like the European Union, but it is important to analyze what consequences it can have for us. The Netherlands looks after its interests and we have to do the same,” the MP for MAN stated.